The Marine Mammal Center was able to reach a deceased blue whale on July 21, 2002 and determine that it was a female, 77-feet long, and most likely had been struck by a boat while alive as it had four massive propeller wounds on the upper right side of its body that sliced through skin and blubber and fractured bone. The Marine Mammal Center is leading efforts to examine a dead 70-foot whale spotted off the Marin coastline Tuesday evening. The whale was floating just inside the November buoy (Marin County coastline). The Marine Mammal Center is part of the Northern California Whale Necropsy Team, operating under authorization from the National Marine Fisheries Service, to investigate stranded whales. As such, The Center will coordinate the landing of the carcass if conditions permit, respond to the landing of the carcass if it drifts onto a beach with the currents, and work with the Necropsy Team to perform the forensic examination on the whale. "I am writing in response to the image which appeared in the May 27th issue of People magazine showing Dustin Hoffman attempting to pull a California sea lion back into the water. While well-intentioned, this action could have killed the animal. A stranded sea lion that does not willingly re-enter the water is most likely suffering from an illness or an injury or is simply in need of rest on land." 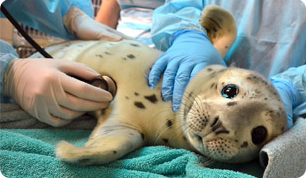 Each year 25% of the harbor seals rescued by The Center suffer from maternal separation as a result of some form of human interaction. Read about what you can do to help protect these fragile pups. Data being collected by oceanographers indicates that another El Niño event is on its way, news which strikes dread in the hearts of all those involved in marine mammal rescue. Ringing in 2002 with another new communications initiative, The Marine Mammal Center is proud to announce the launch of its new web site www.marinemammalcenter.org.